Of all the people on your list this year, the tweens and teenagers can be some of the hardest to buy for. Oh sure there’s always gift cards. Kids like to spend those after they hit double digits. But if you are like me you still love to have something under the tree for them to open also. Gadgets? Sure, why not. But there are only so many electronics you can give. Kids, of all ages, still like something to unwrap and play with on occasion. So happy to share that HexBug has you covered this year for all the tweens and teens on your list. These Tony Hawk Circuit Boards by HexBug are the newest and coolest variation of Hexbug. We received a street set for consideration here. At first I was confused about what this was exactly. But I let the 11-year-old at it and she set it up easily and started performing tricks with it. The street set comes with a Remote control skateboard, a rail slide, a fun box, wave ramp, and kick flip. There are numerous other sets you can buy to build this out and personalize it as you wish. Tony Hawk, best know for skateboarding, and general awesomeness, is also a master of merchandising. This proves it. Take your HexBugs of old and turn their environment into a skateboard park, then give the skateboards each a remote control. These are quite simply a lot of fun and very easy to set up. 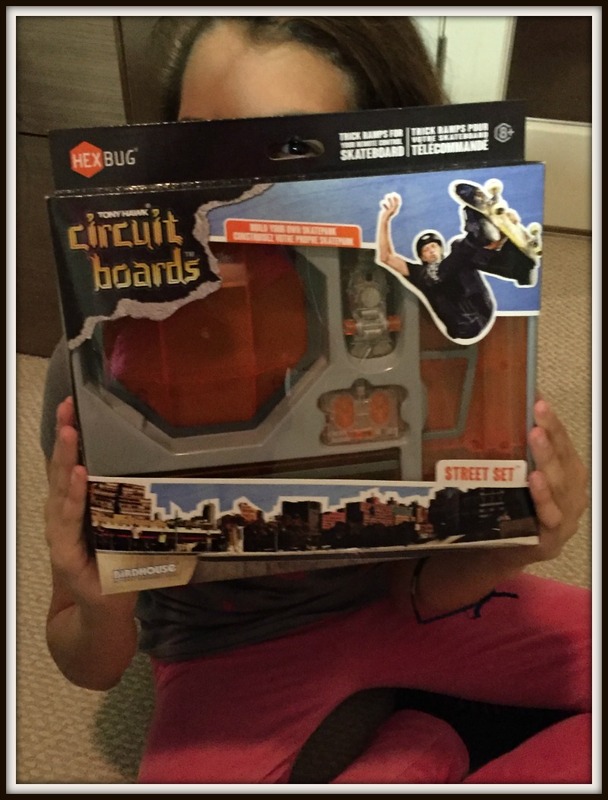 I highly recommend Tony Hawk Circuit Boards this year for any of the tweens or teens on your list. These are for ages eight and up. In fact Hexbugs have a whole host of amazing toys that reach that niche and will keep them super happy. This year Hexbug has been very generous and I also have one Hexbug prize to giveaway. The prize is a Hexbug Hexcalator which was featured here earlier this fall. This time this prize is only open to Canadians so please pay attention to the rules here and enter to win. What do you have planned for your teens this Christmas? I would gift this to my son, he’s a huge Tony Hawk fan! I would give this to my nephew if I won it. I’d love to give this to my nephew, he’d love it. I think this would be a perfect present for my nephew! I will keep it as a present to my friends son or my son for later. My son would LOVE this as a present! Would love to give it to my nephew. My son would be over the moon to have this! This would be a great Christmas gift for my nephew. My nephew would be the one having fun with this if I won. My son or my nephew! Without a doubt this would be for my son. I could also give this to my very good friend’s daughter – she would really love it! If I won it would be going under the tree for my nephew. I’d give it to my son, he would play with this for hours with his friends! Good luck! I know we played with it a lot. Time to get it back out though. This would be so great to give to my nephew! Good luck! It’s a great toy. I love the STEM learning educational value here. My nephew would like this a lot. Would love to give to my son. I would give this to my nephew, looks like something he would like. I’d gift this to my son, he used to do a lot of skateboarding and I’m sure he’d enjoy this. My nephew would like this very much. My son would be the receiver of this if I won! I would give this to my Tony Hawk fan son! I will keep it as a present to my friends son or my son for later! I want to give this to my son 🙂 Happy Wednesday! I would give it to my nephew, he would really enjoy it. This would be a fabulous gift for my son! I’d give to one of my nephews. My son would certainly be the one I would give this to. He would love it! My nephew would have a lot of fun with this since he loves to put things together so he would get it. My son would be the lucky person to get this. I would give to my step grandson. I would give this to my nephew is I won, such a neat kit! I hope I win so I can give it to my son! This would make a great gift for my son! I want to give this to my nephew if I win. This would be for one of my older grandchildren (7 yrs) and I’m tending to lean towards my grandson. No doubt this circuit board would go to my son. My nephew would be the lucky receiver of this if I won! I’m pulled this way and that way but I think it would be for my grandson. My son would be pretty excited to receive this. I want to give this to my nephew! I’m still weighing up the pros and cons but I think that it would be my grandson. My son would be super excited to get this.. I’d have to gift it to him. I would give to my nephew for Christmas. After weighing up all the pros and cons I’m pretty sure this would be for my grandson. I know a few kids who would love it as a present. I’ll decide when I win it. I would love to give this to my boy! My nephew would be the lucky one getting this if I won. Yes, my mind’s made up, well for the moment anyway, it would be for my grandson. I know a few kids who would love it as a present. I’ll decide when I win it! This would go to my son! I want to give this to my friend’s son who just LOVES this sort of thing. I would love to give this to my son. I would give this as a gift to my son Jeff. If I won I would be putting this under the tree for my nephew! This would make an amazing gift for my nephew! I would love to be able to gift this to my son. My son would be the lucky ducky to get this if I won. It would go to my nephew if I won! It would be perfect for my nephew, so keeping my fingers crossed!